Food Trucks Find a Home in Hawaii | We are what we eat! 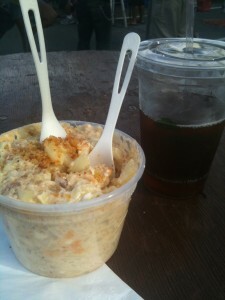 Despite my love for all things foie gras, I’m a fan of food from a truck. I don’t know what it is? The brusk psuedo dominance of the food truck order taker? The idea of hunting for a place to eat sans flies? Is the the inherent danger of food truck fare? Or maybe its just the adventure of being able to pull over and possibly get some of the best food any particular city has to offer. The food truck craze started a couple of years ago, with food trucks tweeting their ever changing locations and in the know “Toodies” tracking then down for their daily guilty pleasure. While the trend has been popular with the people, City Councils and governments (ever the buzz kill) are crying foul over parking and zoning issues. But here in my home of Honolulu, Hawaii, instead of killing the creative entrepreneurial spirit of food trucks and destroying the fried-goodness dreams of “Toodies”, one of the state’s largest landholders has collaborated with local event and business people to create a monthly event called “Eat the Street” (here’s a link to the May 2011 recap courtesy of Nonstop Honolulu). Its the most amazing example of collaborative, creative thinking I’ve seen in a while. Food trucks get a chance to do what they do: cook good food and the peeps know where to find them at least 6 hours a month. The event started a couple of months before I actually got to go, but when I finally went, I brought my husband and my cousin Paul, visiting from Atlanta. When Paul first arrived, my girlfriend suggested he check out the “best pizza here”. I’m sure she thought she was doing his 23 year old stomach a favor, but I was having none of it. Here, in all its truck glory was some of the best local food we’ve got. There was nooooo way he was going to eat pizza – he can go to Chicago for that. Here, we plate lunch. Although we did Waffle Dog (yes, that is exactly what you think it is) it and also Ono Pop it. My favorite flavor of Ono Pop has to be a tie between the mango/habenero/lime and hibiscus/watermelon. But my favorite item of the night sadly, was not a Hawaiian tradition..although, Chef Sean Priester may make it one: crab and feta mac and cheese. Oh, dear lawrd. And its served in a big huge tub that is simultaneously way too large and way too small. But the coolest thing about Eat the Street wasn’t the food. Well. OK. It was. The SECOND coolest thing about Eat the Street is the fact there are at least 20 entrepreneuers there who figured out a way to share their passion and skill without the typical chaos of opening a restaurant. These people just drilled it down to the most important part of eating: food and community. That’s it. Raw and unashamed. Humble yet proud. With people from all walks of life. Moving from truck to truck. The whole event has that “block party” feel. No, not the block party with music so loud you can hear your friend. The potluck block parties you used to have when you were a kid. 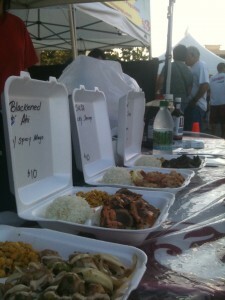 With one difference: the food at Eat the Street is better. (Sorry, Mom).